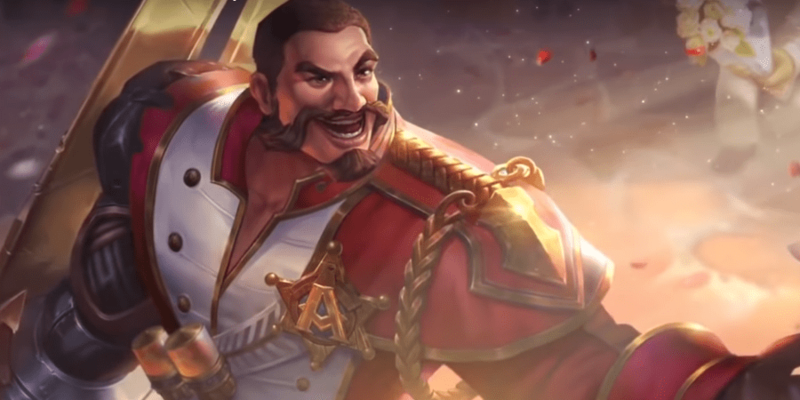 A guide to Arena of Valor's Rourke, the Captain. Rourke uses a spread shot to deal large amounts of damage to enemies up close. Along with his high damage, the Captain sports large amounts of survivability by way of a powerful shield that grows as he fights. Rourke is a warrior/marksman hybrid: a very unique hero combination. Rather than targetting enemies with vollies of single arrows, Rourke unleashes four bolts at a time in a spread. This allows him to strike nearby enemies multiple times. He is very capable at short range combat as a result and is very capable of bursting down enemy heroes in one on one situations. Heavy Burst – Rourke is able to deal out large chunks of burst damage incredibly quickly with his spread shot. While his abilities certainly help, his damage isn’t completely reliant on them and so Rourke will always have some way to blast away his enemies. Durable – As a warrior, Rourke has quite a bit of survivability built into his kit. Determination is a large shield that increases in strength as he deals damage and Bolt gives him an escape for when brawls get out of hand. Mobile – Both of Rourke’s basic abilities provide some sort of movement speed bonus. Charged Shot through a bonus to his movement speed, and Bolt by providing a small dash. Shots can be Blocked – Unlike most marksmen, whose arrows will sail over the heads of any minions or heroes in between them and their target, Rourke’s bolts will always damage the first enemy or neutral creature that they strike. This can make some fights very awkward, minions able to get in the way of Rourke’s shots and save the target. Short-range – Despite holding marksman as a subclass, Rourke isn’t able to do much at a range. His bolts spread far enough that he needs to be right next to his target in order to maximize his potential. Rourke is best suited to either the jungle or the Dark Slayer lane. His durability and burst damage make him adept at fighting both monsters and enemy heroes one on one. Given that his ultimate enhances his survivability rather than his killing potential, Rourke can quickly gank enemies after getting a single jungle buff and reaching level 2. Do not spend too much time on doing so, however, as the enemy team could use the time you spend ganking to invade your jungle. If laning, save Charged Shot for trades with the enemy. It can certainly increase his clear speed but is his only reliable damaging ability. Try to fight away from minion waves. Your shots will land more reliably when creeps aren’t absorbing your fire. Take a rank in Charged Shot at level one. It offers an immense burst that Rourke will need when trading with the enemy. Take Bolt second and focus on leveling it to max first. Despite being a more situational ability than Charged Shot, it increases in damage and lowers in cooldown with each rank while Charged Shot only lowers in cooldown. Take Determination whenever possible. It is an extremely powerful shield that will keep Rourke up and going in the bloodiest of battles. The attack damage and armor are very nice boosts as well, turning Rourke into a machine of destruction. Laning: If in the lane, Rourke will have to stay constantly moving to properly direct his shots. Any minions at the back of the line will need to be approached directly rather than shot from afar, any between Rourke and his target intercepting his shot. Jungling is a much simpler matter, Rourke able to attack without obstruction. If going for an early gank, start from the Might Golem. One on One: Start the fight by charging into the enemy with Bolt, knocking them back and stunning them. Follow this up with Charged Shot to burst away their health and start the fight off with a health advantage (if you need to close a large gap, using Charged Shot into Bolt can work – just be aware that you’ll miss out on the extra damage unless you attack quickly). Continue the fight by blasting away the enemy while staying close to ensure maximum damage. Use Determination when the fight looks to drag on or in anticipation of the opponent’s burst. The damage it provides can improve his initial burst, but it might also cause the enemy to run away before Rourke can finish them off. Team Fights: Rourke needs to attack from the sides to ensure that his shots hit their intended target. Engage the target in the same manner as if fighting one on one, though being more liberal with Determination to mitigate any damage his target’s allies use to try and stop him. Escaping Fights: Bolt is the most obvious choice when wanting to exit a fight, though not necessarily Rourke’s only option. Charged Shot offers him a nice movement speed boost along with its other benefits. If in a heavy bind, Determination can build up Rourke’s defenses so that he can escape enemy damage more safely. This additionally frees the Captain from crowd control effects. This is what makes Rourke much more effective at shorter ranges. Should all four bolts hit his target, Rourke will deal 1.7 times his attack power in damage. This additionally makes critical items less effective on him, the damage amount only raising to the typical 2.5 normal damage when all four bolts hit while Claves Sancti is equipped. The damage listed in the ability description is actually the formula used for normal attacks. If not wanting to do the math, if one bolt hits an enemy, it will deal 0.5 damage, 2 bolts totaling 0.9 attack damage, 3 bolts totaling 1.3 attack damage, and 4 bolts reaching 1.7 attack. Charged Shot – For 4 seconds, Rourke increases his movement speed by 40% and his next normal attack fires special bolts, each dealing 225 (+0.75 AD) physical damage. Reduces target movement speed if all 4 bolts hit the same enemy hero. Given that the only aspect of this ability that scales as it ranks up is the cooldown, it generally isn’t a priority beyond level 1. Don’t forget about the movement speed that this ability offers despite it not being the focus. A small burst of speed can be the difference between life and death in tight places. Use this off cooldown in fights. It offers an immense amount of burst damage when all four bolts hit their target. On the same note, this can be used to quickly build up Determination’s shield when fighting. Bolt – Rourke dashes forward and stops when he runs into an enemy, dealing 180/200/220/240/260/280 (+0.7 AD) physical damage to the target and all nearby enemies, also stunning them and knocking them back. If he runs into an enemy hero, the cooldown of this ability is reduced by 2 seconds. This is Rourke’s main form of initiation. Use it to draw close to the target and briefly stun them. Bolt does not pass through walls or barriers, so be careful when aiming the ability. Rourke moves considerably slower using Bolt than, say, Ormarr when using Unstoppable or Zephys using Death Rift. As such, make the necessary adjustments when using the ability, including predicting where the opponent will dodge. Determination – Rourke dispels all control effects on himself and gains a shield that absorbs 1200/1800/2400 damage. While the shield is active, Rourke is immune to control effects and converts 50% of damage dealt to additional shield value (20% for monsters and minions.) Shield value may not exceed 150% of its original. Rourke also gains 50/100/150 attack damage and 120/180/240 armor for 6 seconds. Use this whenever danger starts to show up in a fight. It will pull Rourke completely out of harm’s way and pump up his survivability. It is especially effective against sustained attackers. While the shield cannot surpass 150% of its original value, continually attacking will allow Rourke to top off his shield points. Avoid letting the fight cooldown if you can help it. Try to avoid letting the shield get burst down. Once it is destroyed completely, Rourke loses all of its benefits. Fight Rourke from within minion waves. While enemy minions will attack you for some additional damage, the amount of Rourke’s firepower that allied minions will absorb for you will more than make up for it. As someone focused on physical damage, a typical damaging set of Onslaught, Guerrilla, and Skewer could do wonders for Rourke. Given his low returns on critical strikes, typical marksmen arcana aren’t the best choice for him. If instead wanting to optimize his survivability, sets of Indomitable, Benevolence, and Valiance can give Rourke some nice staying power. Rourke’s heavy damage can take quite a bit out of an unprepared tank. In addition, Determination will protect him from an control effects they rely on to support their team. That said, tanks should generally be avoided, as they are not overly important targets in fights. As with tanks, Rourke can go toe-to-toe with warriors due to his large amount of burst damage. He will have to be more mindful of when he uses Determination, however, as warriors can generally deal out decent amounts of their own damage as well. Assassins can be tricky, they able to deal out large amounts of damage before Rourke has proper time to react. If able, either stun them with Bolt or activate Determination to offset their damaging combo before laying into them with your own burst attacks. Most assassins operate at close range, putting them in a position vulnerable to Rourke’s crossbow. Heroes that attack from a range can be an issue, especially when there are obstacles between them and Rourke. He needs to strafe around any obstructions until he has a clear shot. This can be done either with Bolt or by walking normally. Get up as close as possible to maximize your damage and minimize the enemy’s range advantage. As with mages, Rourke can have trouble with marksmen who attack him from behind allied units. Strafe around the marksman’s cover and interrupt their damage with Bolt. They should be short work to Rourke’s burst once he’s in range. A support’s control can trap Rourke in a bad position. This is a significant problem for him as he relies so heavily on positioning to deal damage. Avoid supports when you can, the danger involved and the difficulty it can be to kill making them very low priority targets.